We believe every business is unique and deserves the very best Web site design. Our prices are affordable with no hidden costs. It is our goal to create a Web presence that is distinctive and specifically designed for your personal or business needs. Welcome your visitors with an outstanding home page. Grab your visitors right from the start. 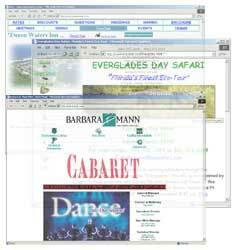 Display your products or services on your very own web page. Display upto 4 images on your site. Collect your visitors' information with your own contact form. Email will be sent directly into your email program of choice. The bottom line is this: we are committed to working diligently for our clients, and to do whatever it takes to absolutely thrill them... Nothing short of that.. We want to thrill our clients!